Over 750,000 people in the UK have already taken the thoughtful decision to plan their own funeral, thereby relieving their loved ones of the stress of making decisions at a time when they are coming to terms with not having you there to help. Of these 750,000 nearly a third have taken out their plan with Golden Charter, the UK’s leading independent funeral plan provider. Doesn’t it make sense to help your loved ones cope after you’re gone? And, perhaps most importantly of all give your loved ones peace of mind. You can decide which plan would be the best for you. Ranging from basic to the most comprehensive, each one can be amended to include your personal requests. With a Golden Charter Plan, your money will always be secure and we will guarantee that your funeral arrangements will be carried out just as you wish. Golden Charter Plans give you freedom of choice and peace of mind. For more details of all the plans available, contact Phillip Tom and Sons…your local provider. When you take out a Golden Charter funeral plan, you have the reassurance that your money is protected. You select how you wish to pay for your plan and, depending on your choice, your money is paid into the Golden Charter Trust or to one of the UK’s leading life assurance companies. The Golden Charter Trust is a separate entity, run by an independent Board of Trustees, whose sole purpose is to manage the Trust’s funds. Your money grows, and when the time comes, your selected funeral director receives the payment, including any growth, and uses this money to provide the agreed services to your family. No matter how much costs have risen in the intervening period, your loved ones will not be asked for a penny more for the guaranteed services included within your plan. Some funeral planning companies restrict your choice of funeral director or limit you to ‘set’ plans. We believe that you should have the freedom to choose what you want in your funeral plan, including what is perhaps the most important choice – which funeral director will look after you and your family to ensure your wishes are carried out. 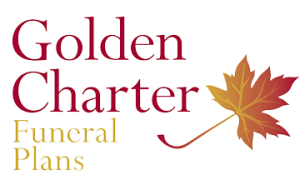 Golden Charter works on behalf of more than 2,600 independent funeral directors – the largest network in the country. These funeral directors are often family-run businesses who have served their communities for generations. They take pride in offering the best local service to you and your family. Although the plan is designed for your own use, it can be transferred and used for the funeral of a spouse or other family member (terms and conditions apply). Should you wish to use your plan to arrange the funeral of a family member, we will make everything as simple as we can. If the funeral is to take place as planned, but for a different person, we will simply transfer the plan. There may be extra costs if the funeral arrangements differ from your own intentions: for example, burial instead of cremation, an additional limousine or a different location. You will be advised of any additional costs before the funeral takes place. We want you to be absolutely certain that a Golden Charter funeral plan is right for you. Therefore, within 30 days, if you are not completely satisfied or have simply changed your mind, we’ll give you a full refund. Every Golden Charter plan fully guarantees the funeral director’s services and includes an allowance, as detailed in the current application form, towards the fees for burial or cremation and, where applicable, the recommended payments to doctors and the clergy or officiant. Any difference can be adjusted by using our unique Personalisation Option. Our plan prices do not include the purchase of a grave. Please bear in mind that the current costs and availability of graves vary considerably throughout the country and special arrangements may have to be made. Should you choose burial instead of cremation, our plans include an allowance towards the opening of a new or existing grave. The purchase of a grave and any monumental work would need to be arranged separately. Your personal wishes can be included in any plan. Floral tributes and newspaper notices are the most frequent requests, but there is nothing to stop you from having something more elaborate or unique. To add personalisation options to your plan, please speak to your funeral director or one of Golden Charter’s friendly advisors, who will establish the additional cost for you. When you’re completely happy about the extra arrangements and the price, they will be added to your preferred plan through the Personalisation section on your application form. When you plan for the future by making a Will or taking out life assurance, you think about your loved ones and what you would like to leave them after you’ve gone. A Golden Charter funeral plan takes care of many of the things you would prefer not to pass on, such as funeral costs and the distress of making detailed funeral arrangements. Instead, you give your family the comfort and reassurance that they are carrying out your specific wishes. Taking out a Golden Charter funeral plan is one of the most thoughtful decisions you could make.